Contemporary Eastern Europe defies its past. Low slung industrial zones and urban sprawl have taken over, but vast stretches of untouched deciduous forests and fields still miraculously remain. Here, in the dense, landlocked Republics to the east of France and Germany, traces of magic linger. The imprint of modern society, however permanent it seems, cannot mask the ghosts here. They recall a time when the soil of the forests lay thick with the blood of crusaders and priests' rites and the ashes of the slain. Wilderness once commanded the earth here as it never could today. Ancient castles sliced through the deep woods of that age. The people answered to the Gods of the forest and of the animals who dwelt there. They worshiped on altars shaped by nature and cut from the bones of the mountains. They followed old traditions, but some of them bore restless blood. The elders of that age called these young spirits 'Sanguisi,' or 'quick of blood.' When they came to a certain age, Sanguisi could no longer follow the old ways. They ventured from the thick cover of trees into the open space and made business with other civilizations and challenged the world. This was fate; it was inevitable; but it destroyed the old traditions. After a century, these 'old ways' were lost to overgrowth in the east. The Sanguisi became tradespeople and hunters and landowners. They began to call themselves Insangerati, a more noble form of Sanguisi. Their numbers grew immense until they stretched up through the valleys and as far north as the coast. They answered to Roman traditions. They grew pious and self important, worshiping on altars carved by their artisans and in buildings assembled by their engineers. In the forgotten lands to the east, Elders' bones were rumored to have been scattered through the ruins of their castles. Hints of pre-Christian myth still lingered out there in the shadows of the trees, but the priesthood scoffed. Insangerati cut trade routes through the edges of the forgotten lands, but dared not venture too far in. They harvested what trees they could on the outlying edges, but avoided inner sanctums of the wilderness. Even in an age of enlightenment, fears and superstitions overrode even the most rational and disciplined minds. The Insangerati became powerful but scattered. Their youngest also bore restless blood, as their parents and grandparents once did. They were distracted by adventures in the wider world. These newer generations trudged far to the west and up over the arctic seas and embraced the inevitability of expansion. A few stayed behind and joined the Insangerati priesthood, and tended to the local communities, while the women found themselves at the mercy of the priesthood patriarchy, relegated to honor-less toil. Many young children in the villages were girls. They weren't adventurers out to challenge the world, like their fathers and brothers and uncles. They trudged through pig slop and managed kitchens for the Insangerati. They began early each day at the farms, feeding animals for slaughter and buying bundles of food. A few strong willed girls traveled as far north as the base of the mountains and as far east as the edge of the forest, but went no further. To go further was to adventure, and girls were not allowed. 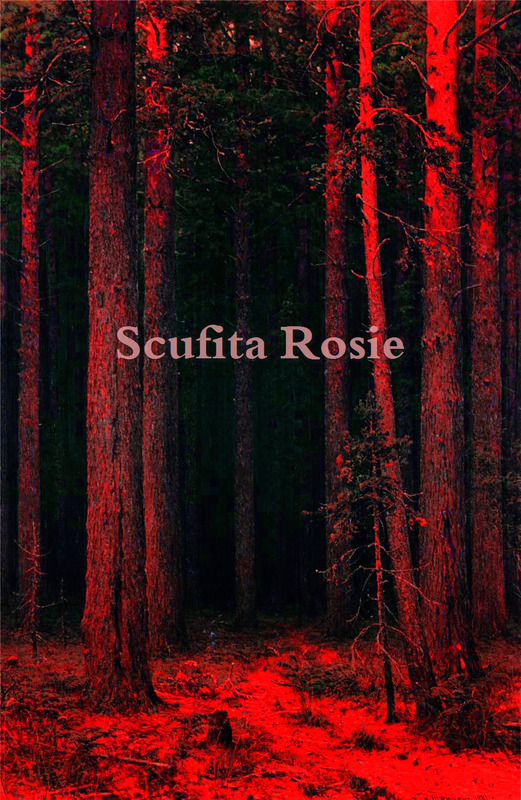 Of the six granddaughters of Muthilde, the last crone from the pure blood Sanguisi, none was more beautiful than the youngest, Scufita Rosie. Rosie was a pale and lithe girl with a long sweep of red hair. Her mouth was a permanent curly cue, twisted and always nearing a wry smile, but never quite. Her large eyes always glistened with the promise of tears, though she never let them fall. She sang with the farmers in the fields as she passed their properties with baskets of food. When the fancy struck her, Rosie danced, but with a unemotional gaze, her thoughts always far away. When Rosie was upset, she never let it show for too long, and when it threatened to overwhelm her, she ducked out of view. When she was happy, though, none could look away, for her smile could light a path in the darkness. Rosie commanded the attention of her older sisters by taking chores seen as thankless and unfitting a girl. She wandered beyond the borders with tightly wrapped scrolls with instructions and supply lists for her father. Her only true allies, she felt, were her grandmother Mutilde and her older sister Izolde. Izolde was a plain and quiet young lady. She was patient, and kind, and always did what she was told. Izolde did not posses Rosie's fire, but the two sisters were inseparable. Grandmother Mathilde sewed over-sized cloaks for all the girls, each of a different color. She taught the girls about how items - and even people - could be possessed by magic. She taught them to revere spirit water and use it to banished trickery. Izolde often wore her green cloak and Rosie wore her red garment. They believed that magic had found its way into the cloth. Whenever the two girls skipped across the field in front of the house, their father often commented, "There goes my holly sprig!" with a gruff laugh. Rosie's father was a butcher. He skinned the carcasses of livestock and shipped out the untreated pelts to tanners. He let Rosie out to deliver these goods, so long as she stayed to watch him remove the skin. All he asked was that she avoid the eastern path. He knew - more than most - of the dangers beyond the east edge of that border. He knew of nothing there but bones and stones and wild beasts who craved the taste of a salty girl between their powerful jaws. "Wolves eat young girls whole." he instructed his children, especially Rosie. "Your grandmother Muthilde can tell you tales that would freeze your blood. Do not take the paths far to the east alone. Stay away from there unless you are a warrior. Even some warriors do not come back from that place." Rosie was not a warrior. A few hardened warriors ventured into the forest and beyond seeking artifacts and riches and had not returned. Rosie, though, did not mind. She was not fond of menial chores, or pig slop, or errands about town. After each of her increasingly long sojourns outside the village, she was punished for disobeying the family. Her chore lists mounted, but she took her punishments defiantly and never lost her determination. She carried out duties; stood for as long as she was required to stand, nodded when asked questions. When she finally retreated to her room, she went silent and cold, waiting patiently for the next chance to sneak out. After her grandmother died, Rosie wiped her tears and looked out the window at the trees and the stars above and told herself she would do what she pleased. Only Mathilde approved of her granddaughter's defiance through silent and veiled glances. Now that her dear old Bunica was gone, it felt to Rosie like a final cutting of a thread to the old ways. Her parents were fixed to the new traditions and would not budge. Her mother did not deign to re-tell the stories passed down to her. Thinking them worthless trinkets, she threw out most of Muthilde's totems, leaving just a smattering of old spirit water in the cupboards to gather dust. Rosie snatched more time away from her family farm and went to town more often. She took orders from her family but also from businesses in town demanding goods from even more distant ports to the north. Rosie clutched order scrolls like precious ribbons and donned a huge brown satchel, and her deep red hood and cloak, and set up north. Her family gave up on disciplining her after a time. She departed for longer and longer stretches of time, and when they asked her, 'where have you been, daughter?' she only replied that she had been sitting and thinking on all her duties to the family. In the Winter of Rosie's twelfth year, Izolde was betrothed to a man from the northeast. She came to Rosie's room grasping her younger sisters hands with tears in her eyes. "I do not want to go, sister!" she cried. "Let's run away together! I do not want to leave you!" Rosie had no words of comfort for her sister, and urged her to go. She knew well enough that the union of the two families was strategic and loveless, and in time, Izolde could gradually reclaim her freedom and return a wife in name only. The carriage came at dawn the following week to take Izolde northeast through the woods, to the village of her betrothed. Two stout warriors helped her up through the carriage door. She glanced back at her dear younger sister, Rosie, and gave a little wave. Just a day later, the carriage returned unexpectedly in Rosie's village. The stout warriors wandered balefully into town, their heads hung low and eyes full of regret. They broke the news to Scufita Rosie's family, hesitating to speak for so long that the girls' father slapped one of them across the face. They at last relayed what details they could, most of which were awful. They spoke of how the carriage had just come through the nastiest thicket in the wood corridor when one of it's wheels caught on a root. The carriage stopped for only a moment. The footman and guards left Izolde there, alone in the carriage, and began lifting the compartment off the ground. While Izolde braced herself inside the carriage, a dark wolf skulked out from a thicket and came up behind the carriage, then underneath. The creature slid up through a loose floorboard, and snatched Izolde around the throat, dragging her through the floor and out onto the path. One guard flung himself on the animal, who dropped Izolde temporarily and sunk his teeth into the man's shoulder, taking a huge piece of him. Satisfied with its prize, the wolf gave a little grin and bent its head down and took the slight girl backed in its jaws. It loped away and disappeared. The warriors ran after it for the better part of a day, but no trace of the wolf and its prize remained except for a few leaves wet with blood. Both families searched high and low for her in the days that followed Izolde's abduction, to no avail. At the urging of Rosie's family, the Insangerati sent bands of torch and saber wielding men towards the woods to find the wolf and destroy it. They returned with nothing except skinned fox pelts and squirrel hides and other small game trophies, and lay them at the family gate as tribute. None of it came as any consolation; least of all for Rosie. Just a sad reminder of a dear girl lost before her time. Rosie had not spoken since learning of her sister's fate. Out of deep fear of losing another daughter, her family locked her and her remaining sisters indoors, in their rooms. Rosie, being the most industrious of the four daughters, was eventually able to creep out into the courtyard at the center of the house. There she could at least watch the sky and imagine being away. In her family's company, she kept her face like stone, but when alone, she gritted her teeth and whittled down sticks with a small knife, and muttered to herself. She imagined killing beasts in the wild. She imagined killing the wolf. In the months that followed, Rosie's other sisters cried and clung to their mother. They picked up cooking books and spoke of marriage, but Rosie did none of these things. She ate like a small bird but felt her body growing. Her moods grew heavy and her bosom expanded, and any sense family duty receded from her, away into the cupboards with the remnants of Mathilde's totems. Rosie crouched low in the broom closets. Duty to sister and to herself reigned - it ventured out past the farm gates and through the hamlets and out past the fields toward the treeline. A proper burial for Izolde never took place, because no one had dared return to the woods to find her body. 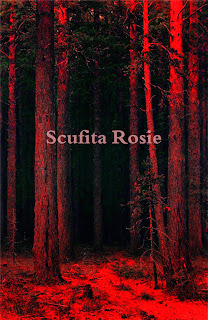 Scufita Rosie's simmering rebellion finally boiled over when it was clear her family and the Insangerati had given up on seeking revenge on the wolf. Just after sundown on the last day of Winter, Rosie took a basket and filled it with a hot meat pie from the kitchen. She grabbed one of Mutilde's old dusty jars filled with spirit water, and the sharpest butcher knife from the kitchen. She threw on her giant red cloak and draped its tresses over the basket, and she wandered out into the dark. She kept her eyes down and her thin, wide mouth like a curly cue set and grim. The clanging of a bell sounded far in the distance. Just as she reached the trees across the field, the moon came out from under a cloud. The grass lit up hazy gray and the shadows of the trees moved along it like widening fissures in the earth. Angry and foul were Rosie's thoughts. The howling from miles away steeled her. Deep, coniferous dark cradled her with her basket and her knife, and her red cloak. She knew by now that the alarm had been sounded in town; that a search party had already set out to find her. No matter; none of them would suspect she entered the woods. Most of them would head north searching for her, and none would trespass to the east. For now, in the slopes of covered darkness that stretched to the Carpathians, Rosie and her fearlessness defied the evil she sought to destroy. Flat crimson bricks lay strewn underfoot, marking where a path once stood. Most of them were knocked away or buried. Rosie was certain; this was the same path Izolde's carriage traveled, the path toward the Elders' castles of old. She'd track the wolf here, and slay it, and drag its carcass back to town. Only then would she find the peace she yearned for. She strode fearlessly into the dark, further and further, until the lights from a distant building grew closer. Rosie was furious. No wolf had yet dared skulk out from the pathway to drag her away. She yearned for the satisfaction of slitting its throat and wearing its pelt. She'd traveled far on her curiosity, her indigence, her awful rage, and now, in the most dangerous corner of the old world, she'd even failed to arouse the curiosities of a wolf. "How disappointing," she murmured, placing the knife in her basket. Her palm was sweaty from clutching it for hours and hours along the trail. "I will just have to see what, or who, awaits me here in this house." It was more like a castle, and yellow light shone down along the path from a high window - a narrow slight cut into a stone tower. This was of the Elders, Rosie knew. This was a place borne from the forest spirits and inhabited by her long dead ancestors. Someone had to be inside. The bottom floor was dark and unadorned, its floor littered with stone rubble. A loud, sharp scraping commenced from somewhere on the floor above her. Rosie wiped her sweaty hand on her cloak and ventured up the stairs. The room she found was sparsely decorated, save for sputtering torches, a few scattered items: a bed and a lamp and an overturned bookcase, and a giant, empty birdcage against the far corner near the window. She realized, almost too late, that an old woman lay on the bed, wrapped in a green shawl. The tiny lady gazed with an absent little grin up at the ceiling. She might have been more than a century old, what-with her papery skin and glassy eyes. "Excuse me, Bunica!" exclaimed Rosie, trying to regain her composure in the presence of an Elder. "I did not know anyone still dwelt here." "Oh, my..." croaked the old woman. "Have you come to visit?" Her tongue moved absently around her lips. "Oh, my...."
"Yes, Bunica, I am a girl of the West." Rosie curtseyed, eyeing the old woman's beautiful shawl. "Are you alone here?" "A girl of the West?" the Elder woman cried. She began to cough furiously. "Of the West!" The old woman's body made no movements and her voice was tiny and shrill, but it reached across the room and beckoned Rosie closer. The girl threw back her hood and took a step forward, revealing the basket in her hand. The old woman let out a long sigh. "I am so hungry, Girl of the West. Please feed me some of that delicious food I smell. Come closer." The old woman's eyes rolled back in her skull and her eyelids fluttered. "I-I am so thirsty. So hungry." Rosie approached the bedside and brought the pie forth. The woman reminded Rosie of her dear Mathilde. "I ask again, Bunica - are you alone? Who keeps your lights burning?" The old crone reached out and grabbed the young girl's arm. Her mottled hand displayed uncommon strength. The castle walls seemed to draw in some energy from the trees outside. It was something older than anything Rosie could fathom. "Why, magic, of course!" the old woman said absently. She let go of Rosie's arm and took the pie, and brought it to her face. She tore into it with an aplomb that shocked the red headed beauty. Rosie stood and watched as the old woman then grabbed a corner of her green shawl and wiped her mouth with it. The green cloth was stained with blood and some familiar markings. Rosie's mouth thinned and her face went as hard as stone. "You are thirsty, Bunica?' Rosie exclaimed. She brought out the dusty jar of spirit water and placed it next to the old woman. "You must drink. This is the purest water I have ever tasted. It is said to let the dead walk." "You are a dear girl. What beautiful hair you have, Girl of the West!" muttered the crone. "You are a sweet girl..."
Rosie could not take her eyes off the shawl. "That is a beautiful green cloak you wear, Bunica. Please - drink the water." The crone now sat up in bed and gave her something like a crazed grin. She looked sprier than she had just a minute earlier. She twisted the ancient cap off the water and raised it to her mouth. Much of the old liquid ran down her wrinkled neck and onto the bed. It thoroughly soaked the old woman's green cloak - the one she used as a shawl. "What-what beautiful eyes you have!" the crone muttered after finishing the water. Something began to happen. Rosie knew it might, for she was not a stupid girl, and she had already taken the knife out of her basket and backed away near the door at the top of the stone stairway. "Wait, girl - do not leave your Bunica!" she cried. The crone changed very suddenly, not by degrees, but all at once. It was as if a deep cloud of illusion and trickery rose off the bed and blew out the slender window, leaving only what was. Lying on its back, its claws in the air, a giant wolf lay there, twisting in old sheets and gnawing on Izolde's once beautiful green cloak. It rolled around onto its stomach and lowered its front haunches. "You are Sanguisi..." the wolf spat. "Old Sanguisi from the new world. You are an interesting girl. I think I will keep you." "Your skinned hide will be perfect on our front gate!" threatened Rosie. She felt no fear; only boiling rage. "Come and let me do my businesses on your throat, you dirty cur!" In a swift motion, the wolf tore the loose bonnet off its head and leaped off the bed. Its fur was matted with dark, wet dirt and its eyed gleamed with a yellow fire. It tried to flank her and move her away from the door frame, but Rosie stayed fixed and determined there. "Your hair will make for a beauteous trophy." the wolf said, curling its gums up into a hideous smile. "Come to me and I will give you a taste of wolf, beautiful young Sanguisi." He longed for her to cry out or beg for her life. Rosie did not oblige him. He hoped to see her flinch as he lunged impatiently at her, but she knocked him away with her sharp knuckles and sliced at his flank. He hurtled through the door and crashed into the stone wall. Oh, how I have missed company as hers. She is not like the other prey. Rosie held the knife out in front of her and refused to take her eyes off him. He crept back into the room and edged her toward the far corner until she was right next to the birdcage. "Put down your knife, Girl of the West. I long to rip your throat out. That meat pie was delicious but the meat was boiled and stringy. I'm sure yours is plump and juicy." Far below, somewhere outside, Rosie heard another howl, then another. A chorus of howls. She knew there was little she could do to save herself. "The others are coming, girl." warned the wolf. "They will not find you fascinating, as I do. If you climb inside that cage, I will spare your life. I will tell the others you are mine. I will..." he paused to lick his chops. "...protect you." Rosie backed away into the rusted cage and closed the door. The wolf, sensing her cooperation, trotted over to the door and howled down the stairs. Several gray wolves appeared and stuck their snouts into the room, sniffing ravenously, but the black wolf staved them off. From inside her cage, Rosie glared at him, at her protector, at the awful dark beast. She would kill him soon, she thought, if given the chance. "She is mine!" the wolf snapped at the smaller wolves. "Let us in!" the others cried. "We are so hungry. We just want a taste of her." The wolf fought them off at last, and, returning to the room, turned his malevolent gaze back at her. The sounds of frustrated, scuffling wolves grew fainter outside. The other beasts were all clearly afraid of him, this big bad wolf with the yellow eyes. "Your hair burns with the fire of the Sanguisi." he said. "I smelled your blood the moment you wandered into my tower. You are a smart, tricky girl, using the Elder-water against me." Rosie clutched at her hair and sawed away at it with her knife, leaving a handful of it. She thrust it out of the cage. "Here, beast!" she offered. "Amuse yourself with my hair. Make a bed of it, if you can, or eat it, for all I care. It is yours to do with as you please." The wolf greedily snatched the hair from her and wandered up onto the bed, where he released it from his jaws and sniffed and licked at it, whimpering. He made a small nest from her locks and soon drifted off, one yellow eye still open and fixed suspiciously on the cage. Rosie knew that if she tried to escape, he'd overwhelm her in an instant, so she waited. She waited much as she had learned to wait in the fixed silence of her house. She bore the burden of passing time with ease. The following morning, a fiery pain possessed Rosie. The wolf roused himself, dissatisfied, and demanded more hair. Rosie reached up and sliced another wide portion of her hair and offered it to him. He carried the bundle in his mouth, looking like a wolf with a long red beard. Rosie almost laughed. "My hair is yours, beast, for as long as it grows!" she told him. "It grows shorter still, I think." answered the wolf. "Its lovely scent only lasts as long as the dark lasts. Then it fades." "I am hungry, wolf!" she called out from the cage. "I am hungrier, red girl." the wolf replied. "My teeth are great for gnashing at bones and rending flesh. You best remember that." Later in the day, the grey wolves came by again and peered in at Rosie in her cage. Long saliva trails traced down their jaws and hit the floor. They panted heavily and looked at each other with anxious desperation. They whimpered and yelped. One of them stepped a paw into the room and the great black wolf leaped from the bed and ran his teeth into the wolf's side, knocking him back - a warning bite. "She is mine!" the beast bellowed. He gave out a series of long croaking barks, and they left again. As he loped back across the room, he eyed Rosie and demanded more hair. She obliged, until it was jagged and shorn and no more could be removed with the knife. Soon, the wolf was no longer content rolling around in her hair on the bed, and he crept to the cage door. "More, Girl of the West. I have a hunger that will not die." Rosie's mouth twisted into a slight smile. "My hair is nothing compared to the scent and taste of my skin. I demand that you show me mercy and step in here with me and take me in, wolf. I demand that you not be hungry and step in here with me." The wolf rolled and shook his head a few times, and clamped his teeth down onto the latch, and pulled it open. He walked in confidently, panting hard and low, until he was just centimeters from her face. His breath was old and stale, and Elder-magic's aura covered him. Rosie sensed his magic was passed down like a stolen artifact, like he wore it as a burden he did not understand. For the briefest moment there, alone in the cage with him, she sensed she knew the wolf; she understood that he destroyed all who entered the forest as a way of protecting the last of something he'd been accidentally tasked to guard, something he never wanted. For now, in the silence of the cage, the wolf was just hungry. Rosie waited until the excited wolf lay down next to her, assessing his options. She wasted no time and bolted for the door, and slammed it, knife in her hand. He barreled against the side of the cage in an attempt to get the door back open. He lifted his neck to pull the lever up with his jaws so he could escape and eat her. She grasped the knife in both hands and plunged it deep into the wolf's neck, through the cage bars. He growled and thrashed but she held on outside the cage, and drove it deeper into the beast. He wrenched his head to the side, letting loose an awful gurgle, and tried to free himself again. The knife was already so far in that as he moved his head, he slit his own throat. Rosie merely held onto the knife hilt and the blade ran across his neck. "Fool! Suffer!" he gasped, sensing his own doom. "Sanguisss...." His words grew inaudible and his voice left him. Rosie yanked the knife out and a spray of blood spattered down her face and body. The wolf stood for a moment longer, then collapsed, then got up again, then collapsed at last. He was finished. He could no longer speak. His eyes burned with the knowledge of betrayal and the pool of blood grew and pushed past the borders of the cage. "You sealed your fate when you killed my sister Izolde!" spat Rosie. "Die in the knowledge that I will proudly wear you back to my village! Die in the knowledge that you sealed your fate when you took her from me!" After the wolf lay still, Rosie sat long at the edge of the bed, watching for his breathing to be sure he was truly dead. After all, wolves were known for their trickery, and this one was especially so. While she sat, she felt the blood congealing on her skin and sealing itself like a mask over her face. She grabbed the damp green cloak off the bed and wiped her face gently until a few streaks of blood remained on her cheeks. She stood, and felt a deep loosening in her gut, and a release between her legs. She understood. Her time had finally arrived. It ran down her legs and mingled with the dried wolf's blood. The torches' yellow light thinned and erupted with a red glow. She took what she knew from her father, and skinned the wolf's haunches and removed the head. By the time she was finished, her wrists and fingers ached from the struggle with bone and muscle. The remains of the dead wolf looked small and the pall of magic no longer surrounded him. She wrenched the creature's jaw and wore his face atop her head. The whole way home, all sense of hunger and fear left her. Rosie was a woman. She sensed the other wolves at her side; not as predators but as children, following alongside her in awe. The other beasts in the forests emerged and prostrated themselves before her as she walked. Something old ran through her, more so than ever. She clutched Izolde's cloak in one hand and the knife in the other as she walked West. When she strode into town wearing the face of the beast, she felt another surge of Elder blood run fast and restless through her. Everyone in town gazed upon her in awe and took in the sight of her as best they could. The foundations of the Insangerati quaked as she looked their way, her smile lighting the darkness. Her family bade her farewell, for they knew she would not stay in the West for long. The East beckoned her. It was then as it is today. Urban sprawl has arrived in these lands, but the seeds of industry cannot find root in the deepest corners of the East. The vineyards of Moldova are known for a prized wine: the Scufita Rosie, a bottle said to come to fruition every thirteen years, no matter the vintage. It is said that even today, consuming a glass leads to the howling of wolves and the ferocity of the Sanguisi spirit.